Hey everyone! I am truly honored at everyone coming to me for Instagram TV advice. I appreciate it because I have always wanted to help those. I also believe in video marketing and its ability to communicate and engage with the community. That is why I am on IGTV to teach and engage in the areas of social media, personal branding and project management. As I have said many times before, IGTV is in its early stages which is why you should be on there. You can position yourself as an expert in your niche. Also IGTV is supported by Instagram which has over 1 billion users! 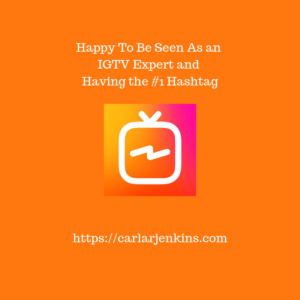 By my being diligent, providing value and helping people, I have ranked #1 in IGTVContent hashtag.